Different arrangements for storing your backups are used at the destination. If a schedule has been configured as an automatic backup, depending on the cycle a directory named BDnn for a daily schedule or BWnn for a weekly schedule will be created above the directory structure described below. In the destination directory, a subdirectory will be created for each source drive from which files are to be backed up. By default for fixed drives these are named DrvC, DrvD, DrvE, etc. If he or she wishes, the user can specify any other name (e.g. C drive). For backups of directories located in the network, the name of the particular share will be used for these subdirectories, while for backups of directories located on a removable drive, this will be the volume name. Each of these directories will contain the same directory structure as on the original drive. The entire source directory structure is retained at the destination. Only directories on one particular drive can be backed up. If for example you specify X:\ as the destination, it will contain a 1:1 copy of the directory structure selected on the source drive E:\. There will be a separate directory structure at the destination for each selected directory to be backed up (see here). The source path will not be replicated. All files and subdirectories copied from the source will be placed into a single destination path. Possible directory name conflicts will be checked for by the program. Update: This is the default mode. If you are not an experienced user familiar with backup strategies, you should use this mode. No files will be deleted from the destination directory (unless the Synchronize backup directory option is selected). will be copied to the destination. The time difference to be tolerated and optionally an additional comparison of file sizes can be selected (see below). Use the archive bit: if this option is selected, only files having the archive bit set will be copied. The timestamps will be ignored. Which files will be saved in this case depends on the option Only files with archive bit set. If this option is selected, only the files having the archive bit set will be copied (similar to the case with Differential/Incremental. Otherwise also those files are copied that previously did not exist in the destination directory. This mode is similar to the Comparison of timestamps mode (see above). The bit remains unchanged unless the option "Reset the archive bit" has been selected. Reset the archive bit: if this option is selected, the archive bit will be reset by the program on successful backup. On all Windows systems the user needs appropriate administration rights to do this. After backing up, you can use Windows Explorer to check whether the backup was successful for a particular file: on Windows 7, either refer to the Attributes column (if selected for display) or right-click the file, then select "Properties" and the "General" tab on which the file attributes are displayed. When an application changes a file, this bit is set again. Full (new): Delete the destination directory and copy all files from source. Clear all archive bits. Differential: Delete the destination directory and copy only those files that have the archive bit set. The archive bits of copied files will not be changed. Incremental: Delete the destination directory and copy only those files that have the archive bit set. The archive bits of copied files will be reset. On the first day, make a full backup to directory A. On subsequent days, make a differential or incremental backup to directories B, C, etc. Full + differential: restore the last differential backup (e.g. E) and the last full backup (A). Full + incremental: restore all incremental backups (e.g. E, D, C and B) in reverse order and the last full backup (A). Already-restored files must not be overwritten during this. Restoring data from such an alternating schedule becomes very simple with the additional program PbRestore. Using this tool, you can automatically restore the latest version of each file relative to a given date. To prevent loss of data when using the incremental or differential mode, the destination directory will be deleted only if the most recent backup did not occur on the same day. Using the Automatic backup function of the program, you can use preconfigured scheduled backups. 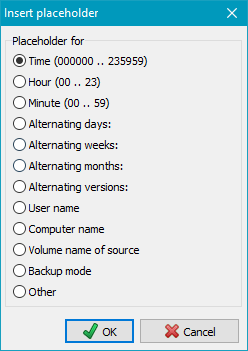 To perform such a backup using Windows task scheduler, you will have to create several backup tasks which differ in mode (e.g. Full and Differential) and destination directories. Let these tasks run at the desired times (e.g. Full on Monday, Differential on other days). The "normal user" might prefer the Update mode to be sure that all current versions of all files will be backed up and are retained in the destination directory. Old files no longer existing at the origin will not be deleted from the destination unless the option synchronize is selected. Backup only files with newer timestamps: All files having a newer timestamp than the one at the destination will be backed up (default). Only older files will be overwritten. Timestamps of source files lying in the future will be changed to the time of the copy. 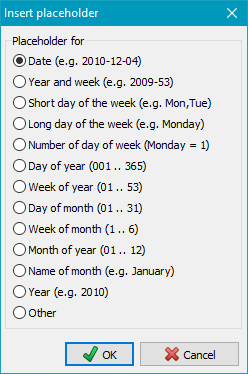 This is necessary because otherwise such files would not be saved after any changes until the (incorrect) future date. Backup all files with differing timestamps: All files with differing timestamps at source and destination will be backed up. Both older and newer files will be overwritten at the destination. Timestamps of source files lying in the future will not be changed. Backup all files with differing timestamps or differing sizes: All files with differing timestamps at source and destination will be backed up (see above). 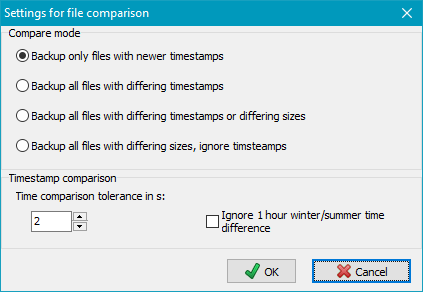 On files with identical timestamps, the program will additionally check if the file size has been changed. If so, also these files will be backed up. Backup all files with differing sizes, ignore timestamps: All files having a differing size at source and destination will be backed up. The timestamp will not be checked. 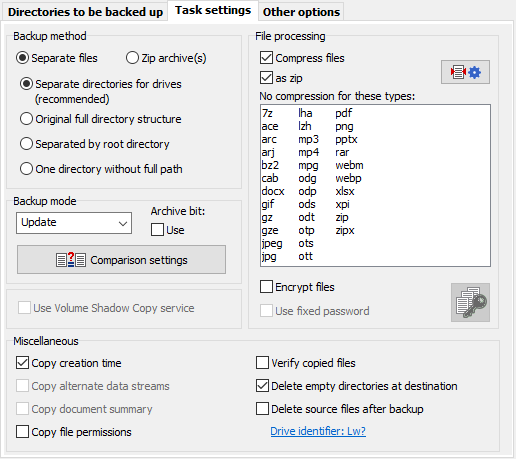 Size comparison: The two options mentioned above using a size comparison are only available on backups via FTP if neither compression nor encryption is enabled. However, backups to a local or network directory can use these options also in combination with compression and encryption. To be system-independent, a default tolerance of 2 s on time comparison is used by the program. If necessary this tolerance can be adjusted by the user. A further problem is that FAT systems use local time whereas the other systems use UTC, hence when backing up from an NTFS partition to a FAT32 partition, there will be time shifts after changing from normal to daylight saving time. On the first backup after a time change, all files would be copied even if they have not been modified because the local time would be one hour in front, which simulates a change. As a workaround, you can allow a difference of one hour plus tolerance. In the root directory of the destination drive, a single zip file (e.g. called Files.zip) will be created containing all files to be backed up retaining their original directory structure. For each directory selected for backup, a separate zip file is created. Within this zip file, the original directory structure will be preserved. A placeholder for date and/or time can be added by clicking the button . At the destination, a subdirectory is created for each drive from which files are to be backed up: DrvC, DrvD, DrvE, etc. (see Separate directories for drives above). Below these, the original directory structure is preserved. 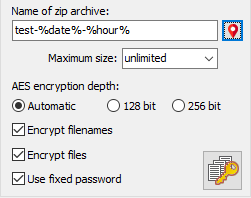 A zip file (e.g. called Files.zip) is created in each of these subdirectories containing all files to be backed up from the particular directory. As above, but without subdirectories to separate different source drives. Note: Bear in mind that zip files will always be created anew at the start of each backup operation. An already-existing zip file with the same name will be overwritten. There is no comparison of timestamps in this mode (see above under Update). If the directories to be backed up reside on different drives, of the above methods only the following are allowed: Single files + Separate directories for drives or Zip files + Separated by drive and subdirectory. The other methods can produce ambiguous results, so if you wish to use these, you should configure separate backup tasks for each drive. %dow% - day of week in the format "Mon, Tue, Wed, Thu, Fri, Sat, Sun"
As with single files (see here) you can also use the archive bit to decide if a file has to be backed up. If the checkbox Use archive bit is selected, only files having the archive bit set will be added to the zip file. Optional, the archive bit will be reset thereafter if the appropriate checkbox is selected. To save space by default, compression with the zip algorithm is used by the program for backing up into single files. File created by using this method are compatible with all standard archive programs (e.g. WinZip and 7-zip) and can also be opened with Windows Explorer. Alternatively compression can be done into gz files. Many file formats (such as pdf, docx and jpg) are themselves compressed. Compressing these files further saves no noteworthy disk space. 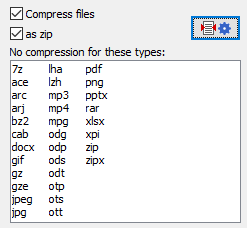 Select which file types you do not want to be compressed in this task by clicking the button. The default settings can be specified in the dialog called from Preferences ⇒ Copy ... in the main menu. zip files: Files of types not to be compressed are packed as zip files without compressing again. That means that just the zip header and trailer are added to the original file. gz files: Files of types not to be compressed are copied 1:1. If necessary (e.g. if you want to have a 1:1 copy of your data) the compression can be disabled completely by deselecting the check box Compress files. All files may be encrypted using the Advanced Encryption Standard (AES) method, the algorithms of which are known to be very secure (more information). You can use it on single files using a proprietary file format or on zip files with a WinZip-compatible file format. It is possible to specify a fixed password for the encryption. This will be stored as an encrypted string in the task file. For even higher security, you should not use this option but enter the password each time manually when starting the backup. On backing up to zip archives, also filenames and directory names can optionally be encrypted. This will prevent an unauthorized person from deducing information about the contents either from the directory structure or the filenames after opening an archive. Important note: Such an archive is not fully compatible with the WinZip format. It can still be opened with programs like WinZip or 7zip, but the original directory structure will not be displayed. Instead, all files and directories are marked with a sequential hex number. On backup, the real name will be encrypted and stored in an extra field within the local file header. To unpack this, the internal restore function or the add-on program PbRestore is required to recover the original directory structure. Single files can also be unpacked by applying the password using a program like WinZip or 7zip, but in this case the filename will not be recognizable. Note: The setting of the encryption depth and the file format for uncompressed and gz-compressed files was changed in version 5.8.5. But restoring of files created by older versions will still be possible. Since Windows XP it has been possible to create Volume Shadow copies enabling the user to backup on the fly also files that are locked by the system or an application. The program must be started as administrator. It is not sufficient to be logged on with an account having administrative rights. Even in this case the program must be started using the option Run as administrator. This is being caused by the protection of the Windows user access control. The local drive from which files shall be backed up is formatted in NTFS. All directories to be backed up in one task are located on the same drive. The operating system is Windows 7 or newer. Only if all these conditions are fulfilled, this option will be enabled and can be used for the backup. Optionally (see preferences) during the creation of the Volume Shadow Copy a log can be written into the file PbVss.log which is located in the same directory as the ini file containing the program settings. In addition, the Backup Components Document Contents will always be saved in XML format to the destination directory (refer to the information provided by Microsoft about VSS). Note: The internal restore function of the program does not at present support this procedure. To restore system files, you need to boot e.g. from a CD with Windows PE to ensure that the installed system is not running. With the NTFS file system, each file has three timestamps for the date & time: Created, Modified and Accessed. By default, on backing up, the program always copies the date & time Modified. Checking the Select creation time option will also copy the date & time Created. The NTFS file system has the capability to link additional data to a file, so called alternate data streams. These streams are hidden from the user in the Windows system. You will need a special utility program, such as Streams from the SysInternals package by Microsoft to examine alternate data streams. After checking this option, any such alternate data streams will be backed up with each file. Notes: This option is only available if both source and destination use the NTFS file system and when backing up into uncompressed single files. This option is not available under Windows XP. After right-clicking any file in Windows Explorer, under Properties you will find the Details tab. The information displayed depends from the particular file type. With Word documents, all global information for the document stored with the file are displayed and with JPEG images EXIF data is shown. With NTFS file systems, there is another possibility for storing information in the file environment (document summary). This data is not part of the document and is not normally copied. To include this, you can select the option Copy document summary. This option is, however, only available if the source and the destination uses the NTFS file system and when backing up into uncompressed and unencrypted single files. The FAT32 file system, often used on external drives or USB sticks, does not support this feature. The user should check for himself whether this copy option is required. Normally it is not necessary either for MS Office documents or for JPEG images because all detail information is stored in the files itself. At the moment, no applications using this NTFS feature are known to the author. In NTFS file systems and network shares, an access control list (ACL) that specifies the permissions for each user is associated with each file and directory. To view and change these permissions, right-click the object, select Properties from the menu and the Security tab. If this option is set, the permissions associated with each file and directory will also be copied during backup if both source and destination support this. Important note: If this option is enabled, copying of files will be slowed down considerably. The Windows caching must be disabled in this case to ensure that the file is stored completely on the destination data medium before the verification will take place. Generally it is not necessary to use this option because the security measures applied by the system are quite enough. After backup, the destination will be checked for empty directories. If this option box is checked (default), they will be deleted. This option will delete source files after a successful backup (Verify copied files is switched on by default). You will need this option only in exceptional cases: since the source files are deleted, be very careful before choosing it!